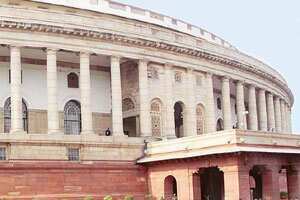 New Delhi: Moving a step further towards enactment of a historic law for setting up Lokpal, government on Thursday tabled a bill to this effect in the Rajya Sabha, but it was rejected by the Opposition as “constitutionally vulnerable". Pushing for passage of the crucial bill, Narayanasamy said it “is in line with the sense of the House" expressed on 27 August. Initiating the debate, leader of opposition Arun Jaitley slammed the bill saying it would lead to “constitutional havoc" as the Centre would be encouraged to “usurp" rights of states through the provision of setting up of Lokayuktas. The BJP leader and noted lawyer also opposed minority quota in the Lokpal bench, inclusion of NGOs and keeping CBI out of the purview of the ombudsman. “If you are creating history, let us not create bad history. We will be leaving a lot of task for the next generation to do," he said. He made it clear the BJP would not support the Bill in the present form. “Please accept amendments that the colleagues have moved," he said. Abhishek M. Singhvi (Congress) rejected Jaitley’s contentions, saying said the BJP was creating fear psychosis over the issue of NGOs under the purview of the ombudsman. Seeking to drive a wedge between the UPA coalition partners, Jaitley encouraged Trinamool Congress by saying that its opposition to various provisions of the bill was correct. Holding that one does not have to demolish federalism in the fight against corruption, he said, “That is why the Trinamool Congress is right." BSP member S. C. Mishra also criticized the bill for keeping CBI under government control and said the agency is used to settle political scores. He claimed that cases against Uttar Pradesh chief minister and BSP supremo Mayawati were an example of such misuse. Mishra appeared to attack Rahul Gandhi when he said that a Congress leader goes to Uttar Pradesh and says that “we (Centre) have sent money...Is it your (Centre’s) property? It is our money." He said the reservation for minorities in the Lokpal bench and search committee was done under pressure as the Congress treats minorities only as “vote-minting machine". Amidst protest from Congress members, he said it was a “day of misery" for the ruling dispensation and counseled them to listen patiently to the criticism. During the debate, which saw exchange of barbs between Jaitley and Singhvi, the Congress member rejected opposition’s stand on reservation, saying the bill does not have any provision for quota and only talks about ensuring representation from diverse sections of the society. He accused the BJP of giving an “advanced prematured certificate of unconstitutionality". He said the Lokpal bill does not cover all private trusts but only those, which receive public donations above a certain amount. Strongly batting for constitutional status to Lokpal, Singhvi attacked BJP saying it was opposing the bill only for the sake of it. He told Jaitley that his argument that the bill was a constitutional cocktail does not have any punch. Rejecting charges of assault on federalism, the Congress MP said Parliament has the power to make laws for whole of the country or for any part. He said the bill for the first time separates prosecution and investigative powers, abolishes the practice of seeking sanctions before prosecution of public servants and gives Lokpal greater control of CBI even though it does not bring the agency directly under the Lokpal. Holding that Government’s approach is that of favouring mutual checks and balances, Singhvi said it wanted to maintain equilibrium of the holy trinity of the legislature, the executive and the judiciary. Asking the Opposition to be honest in its conviction, the he accused it of using conditionalities and excuses to avoid supporting the bill. Criticizing the Opposition’s suggestions on Lokpal, Singhvi said their idea is to create a behemoth before which even the Prime Minister and his office will look like “pygmies" and also create a breeding ground for “big ticket corruption". He said BJP’s opposition to the bill was just to score browny points with an eye on the forthcoming assembly polls. The Congress leader vehemently denied that the bill marks any deviation from the sense of the House on Lokpal issue to which the government had agreed in the Monsoon Session. Urging the Opposition to support the government on the issue, he said “history will not forgive you (Opposition)" if they do not support the bill. Singhvi said a slew of anti-corruption legislations have been made during the UPA regime. Jaitley earlier said the investigation mechanism proposed in the bill is such that a probe can never be completed. “Criminal investigations are never done in a round-robin (manner)," he said, adding that Opposition’s demand was just to make CBI an impartial investigating agency. He said chairman of Lokpal should be included in the panel to select CBI director. The opposition leader said the government has deliberately brought a law which is constitutionally vulnerable. “You want to kill the Lokpal when it is still in the womb ...lets not create a bad history," Jaitley said adding the amendments proposed by Opposition would remove the deficiencies in the bill. “We will pass a Lokpal, (but) not your (government) Lokpal," he said. Seeking a relook and rethink on the bill, S. C. Mishra (BSP) said it is “totally illegal" and a “fraud" on the Constitution and will be struck down by the court. “We should not make laws under pressure," he said. Rejecting Singhvi’s contention that Centre can enact laws under Rule 253, which can be applicable to the whole country or in parts to cater to international treaties like the UN convention, Mishra wondered whether the government wants to control all state subjects through this provision. “It will completely ruin the federal structure", he said wondering whether the Centre was planning to clamp emergency in the country. Sitaram Yechury (CPI-M) said the spirit of the Constitution must be kept in mind while framing the law and added that the government should accept the amendments to make a stronger Lokpal Bill.